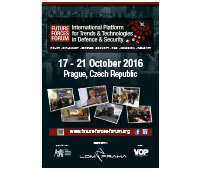 Future Forces Forum is a highly recognized and widely endorsed international platform for defence & security information exchange and for promotion of the allied countries and their partners’ objectives within national and global security. The project consists of a compilation of events and activities at a high political, military and expert level. All events are primarily focused on the presentation of current and future needs of the armed and security forces, state-of-the-art technologies and R&D programmes with interactions between all involved participants due to the interconnected topics.